HYPERCHARGE PCS, BATTLE TANKS, CLOCK CAVEMEN, CRASH COPTERS, STACK SOUNDS, SEEK SHIPS, DISINFECT ISLANDS, WORK WORDS, MANIPULATE MICE, AND MORE. The key to success in today's information-oriented society is organizing and managing your data. All that information you have stored in your PC won't do you much good if it's hard to get to. Bright-bill-Roberts' HyperPAD lets you create push-button solutions to do this. 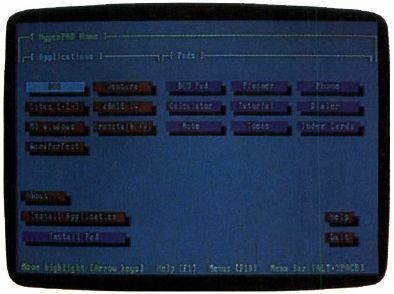 Similar in concept to the Macintosh's HyperCard, HyperPAD is a professional productivity tool that allows you to organize and link information together in almost any imaginable manner. You create screens of information, called pages, and link them together to form a pad. Buttons that you add to various pages in the pad can link them together or be used to launch other programs. The package includes a well-done, powerful home pad that performs as a DOS shell and as a launching point for creating new pads. A number of valuable sample pads are also included. Not only are these other pads useful, but they serve as good examples for creating your own pads as well. Getting around in HyperPAD requires that you invest some time at the start. To activate onscreen buttons, click on them with your mouse pointer or press Enter when the button is highlighted. The arrow and Tab keys move the highlight from one button to the next. Pull-down menus and shortcut keys provide additional commands. The plethora of choices presents an initial challenge, which is compounded by a bit of confusion because the Tab and cursor keys seem interchangeable at some times and at others, don't. But once you've learned how to navigate, you can begin to appreciate this innovative interface and information manager. HyperPAD lets you customize pads to organize and access your information. I was frustrated during the early stages of creating pads, but in the end I gained admiration for the program. The manual takes you step-by-step through the process of pad creation as you build a To-Do List. This simple example proved easy, but experimentation presented a set of unexpected difficulties to which the manual provided either unclear answers or no solutions at all. Fortunately, I was able to solve many of my problems by trial and error, but not all users will want to take that route, nor should it be expected of them. A great program like this deserves a more complete and descriptive manual. Each pad contains at least one page. You can add pages, define attributes for them, and place buttons and editable fields anywhere on them. You can spruce up your pages with titles and by adding different shadow, fill, and highlight colors. You can create rudimentary graphics designs using HyperPAD's painting functions. However, potential PC Picassos should be warned that HyperPAD runs on a text screen, so you're limited to using character graphics. Any object you place on a page must be accompanied by a script if it's to be of any use. You write scripts in a special language called PADtalk. You should find the scripts easy to write, because PADtalk's language is much like English and its logic is uncomplicated. I was pleasantly surprised to find that, within an hour of starting, I could create pages that faded out and peeled off to other pads and pages. After about a day's work, I had a page that reminded me of uncompleted chores, I had note cards for important addresses and phone numbers, and I even had background music. More complicated applications will require much more time, but this indicates the relative ease with which pads can be created. HyperPAD's flexibility gives it the potential for use in a wide variety of applications. It can be used as an information organizer or even as a simple database manager. You can also use it as a DOS shell. Once you set up a shell pad, you can simply press a button to start a program instead of going to a subdirectory and typing the program name. HyperPAD is more powerful in this respect than many dedicated shell programs because each button of a pad can represent a complex set of instructions specified by a PADtalk script. According to Brightbill-Roberts, a program that converts Macintosh HyperCard stacks to HyperPAD format is under development by a third party, which would make thousands of HyperCard stacks into a resource for HyperPAD users. One advantage HyperCard enjoys over similar programs like HyperPAD is that almost every Macintosh owner has a copy (it comes free with the Mac operating system). You can't access HyperPAD pads unless you're running the program, so you can't share your pads with other users unless they own HyperPAD. However, developers can create stand-alone pads by licensing a special runtime version of HyperPAD. HyperPAD's power, its ease of use (especially when creating pads), and its potential applications elevate this program to a level few others achieve. For many PC users, its value is enormous.